Everyone knows that Apple (AAPL) under Steve Jobs performed wonderfully. But if you ask employees, the Mac maker is doing even better with Tim Cook at the helm. According to employee satisfaction tracker Glassdoor, 97% of Apple workers surveyed approve of the job Cook is doing. Jobs managed a 95% rating in the months before stepping down due to the recurring illness that ultimately proved fatal. When Jobs resigned in August, many investors and industry watchers believed Apple wouldn't take long to show signs of decay. Yet none of the doomsday scenarios have come to pass. Revenue zoomed 68% last year as profits nearly doubled. The stock, which closed at $378.25 on the day Jobs died, has rallied more than 60% since then as investors have learned to appreciate Cook's style, which includes paying a handsome dividend that eluded shareholders during the Jobs era. As one employee put it in a Glassdoor review posted earlier this month: "Tim and the [executive team] are doing a great job. Keep up the good work." As executives, Jobs and Cook are both exceptional. Glassdoor founder Bob Hohman says the average CEO achieves a 62% approval rating, and that's across more than 280,000 ratings for 150,000 tracked companies. Yet Cook is more exceptional than most because of the leader he replaced. "Very rarely do you have a founder replaced by a non-founder who's held a rating like this," Hohman said in an interview. "In fact, I've never seen anything like it." It's easy to forget that Cook subbed for Jobs twice before taking the reins permanently. The first time, in 2004, Cook oversaw massive increases in iPod sales as listeners took to the iTunes store for music downloads. In 2009, he downplayed the impact of netbooks while helping shepherd the first iPad into production. The third generation of the product just sold 3 million units -- in a weekend. Like Jobs before him, Cook engenders loyalty through focus and clarity. "[Great leaders] have this ability to point to the mountain and say very clearly: There's where we're headed," Hohman said. 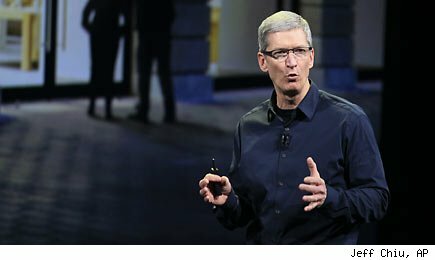 Five of the eight chief executives to achieve a 90% or better approval rating lead technology-focused companies: Apple's Cook at 97%, Qualcomm's (QCOM) Paul Jacobs at 95%, Google's (GOOG) Larry Page at 94%, Intel's (INTC) Paul Otellini at 93%, and VMware's (VMW) Paul Maritz at 90%. General Electric's (GE) Jeffrey Immelt earns the honor for most improved with a 19-point jump in his approval rating year over year. Hohman attributed the gains to a renewed focus on the sort of training that made GE famous during Jack Welch's reign as chief executive. Goldman Sachs (GS) CEO Lloyd Blankfein may be widely disliked by outsiders -- especially in light of accusations that management encourages brokers to rip off clients -- but 89% of insiders still approve of the job he's doing. Will that rating hold? We'll know in six months. Most surprising of all, 85% of Sprint Nextel (S) employees approve of CEO Dan Hesse despite massive debts, shrinking cash flow, and a failed attempt to convince the board to make a bid for peer MetroPCS (PCS). Last year at this time, only 77% of Sprint workers approved of Hesse's job performance. Yet for all the winners in Glassdoor's report, none come off nearly so well as Cook and Apple. The ratings suggest that one of Jobs' deepest desires -- one he expressed to writer Walter Isaacson in the authorized biography, Steve Jobs -- is already being fulfilled. "My passion has been to build an enduring company where people were motivated to make great products," Jobs told Isaacson. Judging by Glassdoor's findings: It is, and they are. The iPhone and iPad started a technology revolution. Click here for a free research report about three companies quietly cashing in on this trend. Motley Fool contributor Tim Beyers owned shares of Apple and Google at the time of publication. The Motley Fool owns shares of Qualcomm, Apple, Intel, and Google. Motley Fool newsletter services have recommended buying shares of Intel, Goldman Sachs, Google, Apple, and VMware, and creating a bull call spread position in Apple. GAMCO didn't do very well for investors in 2010. The price of the company’s shares was flat, considerably underperforming the S&P 500 increase of 14% that year. The company manages mutual funds and other investments for private individuals and public enterprises. But GAMCO had a relatively good year in terms of revenue and earnings growth. Revenue rose from $218 million in 2009 to $280 million. EPS was up from $2.03 to $2.55. Even so, based on the relatively small size of the company and GAMCO’s overall performance, Gabelli is overpaid. Aetna’s shares were down 7% in 2010, underperforming the S&P 500 by a large margin. But Williams’ pay was based on several factors, none of which was stock price. EPS, pre-tax operating margins and an increase in the dividend were the major measures of his performance, according to the board. The board can make the case, persuasively, that the insurance firm had a good year financially in 2010. The company’s EPS rose from $2.84 in 2009 to $4.18 last year, even though revenue fell slightly from $28.3 billion to $27.6 billion. Williams retired in 2011. The board gave Williams a relatively reasonable package as he left, at least based on 2010 performance. Vornado’s shares significantly outperformed the S&P 500 in 2010, up over 17% for the year. The board says it relies on EBITDA and total return to shareholders to set CEO pay. Both improved in fiscal 2010 compared to 2009 as EBITDA rose from $1.7 billion to $2.2 billion. Vornado produced strong financials on a GAAP basis as well. Net income per share rose to $3.24 in 2010 from $0.28 the year before. Revenue rose from $2.7 billion to $2.8 billion. Fascitelli is a CEO who earned what he made. The clothing designer and manufacturer gave investors an extremely good return on their holdings in 2010, as share price jumped 35%. In the fiscal year that ended April 2, EPS rose from $4.85 to $5.91, and revenue grew by 13% to $5.7 billion. The one question investors might ask is whether Lauren’s compensation is based on fair deliberations by his board. The CEO owns shares that hold 75.6% of the corporation’s voting rights. When it comes to how investors in General Growth fared, timing was a major factor: Did they buy in before or after it emerged from Chapter 11? The company entered bankruptcy in April 2009, and it became clear as early as April 2010 that it would exit Chapter 11 later in the year. The company returned to regular operations when the final reorganization was approved last November. The gain in the company’s shares from early 2010 to the end of the year was 14-fold. While the bankruptcy process makes it impossible to make reasonable P&L comparisons from 2009 to 2010, revenue has remained steady. Metz earned his money for those who took a chance on the company’s stock early last year. CVS Caremark shares underperformed the market last year, rising only 8%. That alone makes it hard to justify Ryan’s compensation. The company's financial results were also poor. Revenue fell from $98.7 billion in 2009 to $96.4 billion in 2010, and EPS fell from $2.55 to $2.49. Verisk slightly underperformed the market with its shares rising 14% for the 2010 calendar year. For that return, Coyne's pay package is extravagant. Still, Coyne should get credit for a relatively strong year in other ways. EPS rose from $0.72 in 2009 to $1.36 in 2010. Revenue rose from $1 billion to $1.1 billion year-over-year. TRW shares soared during 2010, ending the year almost 105% higher. The extraordinary performance was driven by EPS, which rose from $0.51 to $6.49, as revenue moved from $11.6 billion to $14.4 billion. TRW, which supplies car parts, benefited from the rebound in the auto industry, but Plant’s compensation is reasonable based on the results he delivered to shareholders. Gemunder’s 2010 pay package can't be justified based on shareholder returns. The firm’s stock was up only 2% for the period. It's no wonder the shares didn't do better: The company’s EPS fell from $1.81 in 2009 to a loss of $0.91 in 2010. Revenue fell from $6.2 billion to $6.1 billion. McKesson’s shares were up 13% in 2010, underperforming the S&P 500. And while its revenue was $112 billion in 2010, up from $108.7 billion in 2009, EPS fell from $4.62 to $4.29. In that light, it is hard to imagine how the board of McKesson could have justified giving Hammergen such an extraordinary compensation package.